If you don’t like yogurt you will HATE this cake. That was the reaction given to me by my brother’s neighbour’s kid. “Yucks, this cake tasted horrible!”. Well, later my mom told me, this boy doesn’t even eat cheese on his pizza. Ok, so that explains it. Another kid exclaimed to my niece when she saw the cake , “Eh, why your cake has nothing one”. I think they are pretty used to elaborately topped cakes from local bakeries. Some bakeries here will use plastic toppers like toys and such to visually enhance it. Adults instead found this deco to be elegant and beautiful. Well, my niece has turned 9, and she is the type that prefers simple designs rather than anything that looks elaborate and this cake is for her. Her sister will prefer more colourful stuff. When the cake was cut and served, it wasn't well recieved by the kids. But my sister in law loved this cake. She told me, one of her favourites from the other cakes I've made, that she's eaten before. LOL. The problem was, the cake wasn’t chilled well enough when it was served earlier, so it was pretty wobbly and mousse cakes are horrible when not properly chilled. She had one piece after the kids were gone and the cake was much better set. It was a party held at home, and imagine how many times the fridge’s door was opened and closed. Hence, the cake softened up when it was finally served and the fridge wasn’t that cold too on a hot night, mid February is a killer time. Nowadays, I’ve been baking sponge cakes without a referred recipe.. just throwing in what I felt like it. This is the recipe I concocted this time. I beat in the flour, milk and oil on low speed. It is still soft and fluffy. 1. Preheat oven at 150C(fan)/170C. Line the base of a 9 inch pan. 3. Remove 60% the beaten eggs into another bowl. 4. With mixer on low speed, mix in flour by the tablespoon. When all the flour is incorporated, mix in milk mixture. Then mix in oil until well combined. The mixture is partially deflated but not totally flat. 5. Pour the reserved beaten eggs in and fold until well incorporated. 6. Pour the batter into the prepared pan, level it and bake for 25 minutes or until done. 8. Slice cake into 4 layers and trim each layer to fit an 8 inch ring. (Cake will be about 8.5 inch after cooling. Keep cake covered all the time before time of assembly to prevent drying out. 1. Prepare an 8 inch ring. Line the inside of the ring with either non stick baking paper or cling wrap. Place cake ring onto a 11 inch cake board. 2. 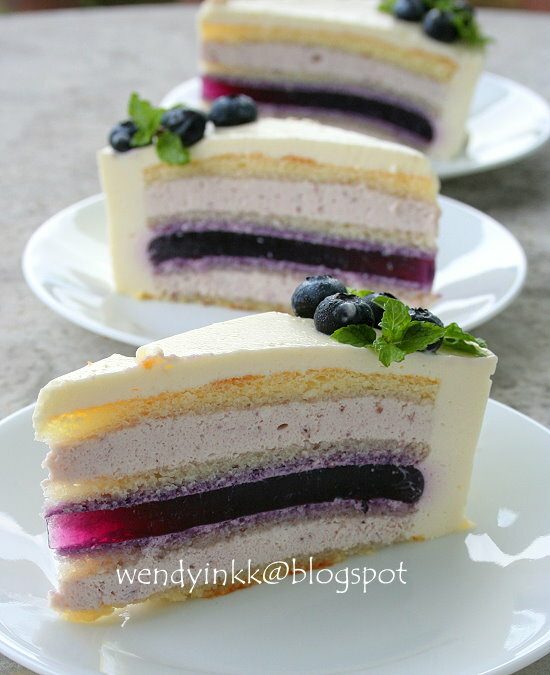 Place one layer of cake into the cake ring and pour half the blueberry mousse in. Level the mousse. 3. Take another piece of cake and spread 1 Tbsp of the mousse on it. Place it cream side up in ring. 4. Remove gelee from freezer, peel away the plastic wrap and lay the gelee into the pan. 5. Take the 3rd piece of cake and spread 1 Tbsp of mousse on it. Place it cream side down onto the gelee. Gently press the cake to even out. 6. Pour balance of mousse in and top with final piece of cake. Gently press to even out. 7. Chill for 3 hours minimum before the next step. 8. Remove cake from fridge and remove cake ring and liners. Place a 9 inch cake ring around cake. 9. Put yogurt mousse into a piping bag, snip the end and squirt the mousse to fill up the sides first. Lastly pour the mousse over the cake and spread to level. 10. Chill the whole cake for 1 hour. Arrange blueberries deco on top(gently press in) and chill for another 4 hours. 12. 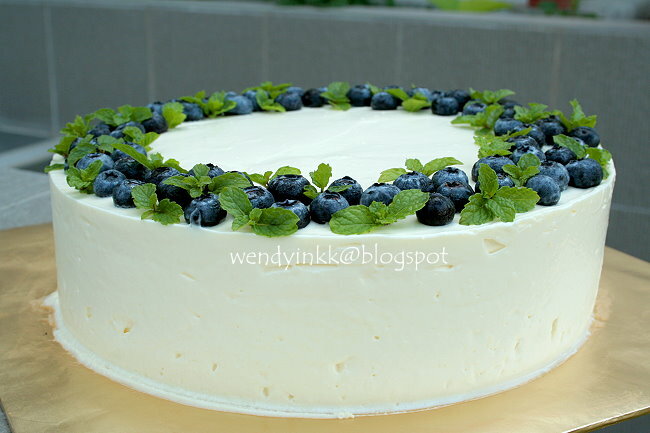 Decorate with mint leaves and place the cake back into the fridge until time to serve. 1. Put blueberries, water and sugar into a saucepan. Bring to a boil and lower to a simmer until blueberries are bleeding and getting all mushy. 2. While waiting for the blueberries to cook, put water into a large measuring cup (or a 2 cup capacity bowl will work just as fine). Sprinkle gelatin over the water and let it sit to bloom. 3. When the blueberry is done cooking, place a strainer over the gelatin and pour the blueberries and syrup over. Press the berries and reserve the scraps for the mousse layer. 4. Remove the strainer and gently stir the gelee mixture. Taste, if not sweet enough, add more sugar. You should have about 350ml of gelee. 2. Leave berries to cool down combine with yogurt and blueberry scraps. Blitz until the blueberries are fine. Set aside and keep chilled. 3. Put 2 tbsp water into a bowl and sprinkle gelatin in. Melt it either in the microwave or hot water bath. Refer here. Set aside while you whip the cream. 4. Put cream into a chilled bowl and whip until soft peaks and put in sugar and whip until medium stiff peaks. Beat in melted gelatin (remember to scrape every bit of the gelatin in). 5. Pour the blueberry yogurt into the whipped cream and fold. 6. Use this to assemble the cake right away. 1. Put 2 tbsp water into a bowl and sprinkle gelatin in. Melt it either in the microwave or hot water bath. Refer here. Set aside while you whip the cream. 2. Put cream into a chilled bowl and whip until soft peaks and put in sugar and whip until medium stiff peaks. Beat in melted gelatin (remember to scrape every bit of the gelatin in). 3. Pour the plain yogurt into the whipped cream and fold. Taste, add more sugar if needed. 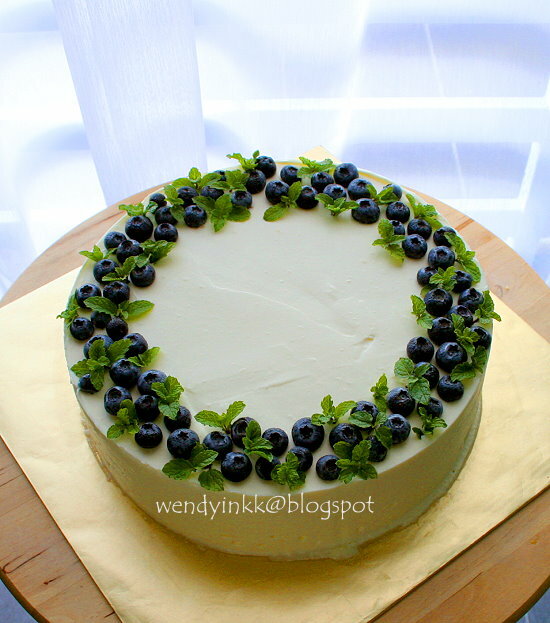 Wendy, I like this cake too, simple deco but looks so elegant! 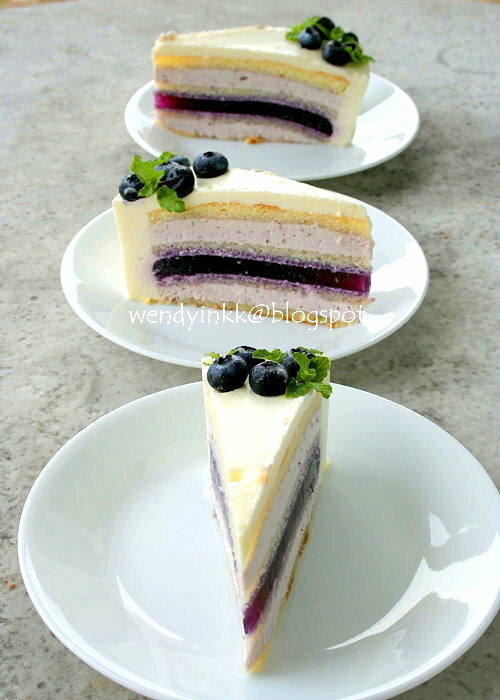 The sliced cake, look even more attractive! i love cakes like this....some shops spend so much time deco the outside with inedible stuff that inside is nothing to shout about. I think this cake is simply Awesome! I would love to have a slice. i am not very understand this sentence from "Assembly" --> 1. Prepare an 8 inch ring. Line the inside of the ring with either non stick baking paper or cling wrap. Place cake ring onto a 11 inch cake board. can you please explain abit? Beautiful deco.. elegant looking ... BUT again too much work for me ! Love the cake ! I like your cake presentation. Very neat and classy :) The layers are awesome ! My... this is such a pretty and elegantly designed cake! Thanks! I was glad the layers were fine! LOL. I wish I have someone to buy me this instead, LOL. No pain no gain de..sometimes must pain a bit. U use a 11 inch cake board. then you use 8 inch cake ring. To ease removal, you put paper/plastic inside the ring. that's before the cake was sliced. Well kids, they like fancy plastic toppers, or character cakes. I totally agree, you've decorated it so elegantly. Absolutely love the ring of blueberries with mint. Very classy. Funnily, it reminded me of the crown of thorns that Jesus wore (i think i am in a very christmassy mood these days :p). I am still at carrot cake stage ie kindergarten. This is form 6 level. Long way for me still. when I deco it, I was actually quite sick with mint, LOL. My montebello also sama with mint, and this was made not too long after that. Yes, it does resemble the crown of thorns. Wendy, you are really good! The cake looks so pretty... so beautiful that I will not bear to cut and eat it. BTW, I promise the kids to make the rainbow egg jelly together with them tomorrow. Hopefully, it turns out like yours! What an incredibly beautiful cake. Your cake looks so awesome! 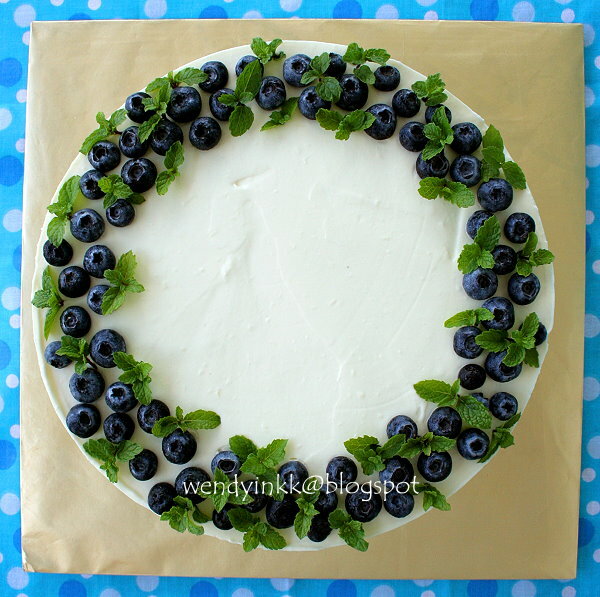 Loved the way you decorate with blueberries and mint leaves. Really clever! This cake is simple yet beautiful and elegant. hello! 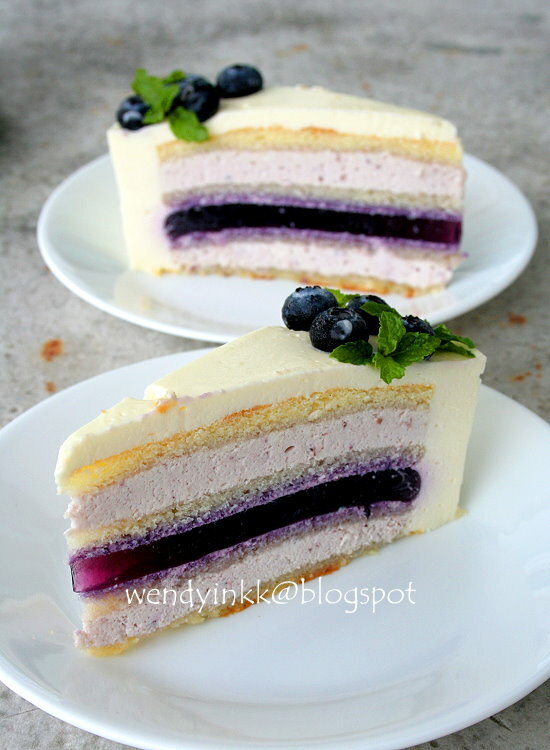 I was actually looking for pandan layer cake recipe and I find more interesting recipe!! =) For this mousse cake..can I use any kind of yogurt? or greek yogurt? 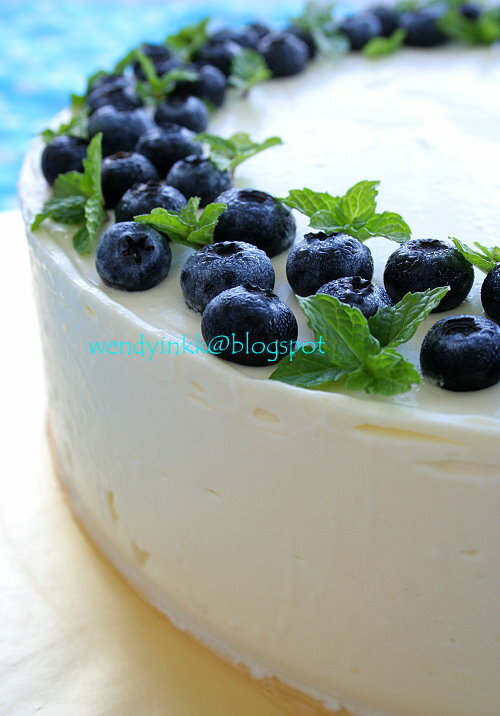 Greek yogurt could be a bit too rich, but if you like it that way, it's ok.
hello~ i think i had a question before regarding the type of yougurt you are using (i'm still waiting for you reply =) )...and another question, is it possible to use this recipe with 7inch and 8inch cake ring?? thank you so much!! There's no more pending comments in my inbox, I think that's all I saw. For 8 and 7 inch rings, reduce the recipe by 25%. For the eggs, use 4 grade C eggs, approximately around 220gm with shells on. If the gelatin amount is very little, as in, the yogurt is still spoondable like cream, then just follow the recipe as it is, and adjust the sweetness according to ur preference. Yes I did, refer instruction no.8 for sponge cake. It's gorgeous! But is there any way to do it with agar as I'm veggie? For the gelee, Substitute the gelatin with 1/2tsp agar powder for a soft set jelly. After you mix with the 50 ml water, there's no need to heat it up, instead, the strained blueberry juice needs to be brought to a boil, and then you pour the agar mixture into it. Must bring back to a boil and pour into the prepared pan. Agar doesn't need a lined pan, and it can not be frozen. For the yogurt layer, probably you need to substitute half the yogurt with milk, and use 1tsp agar instead of gelatin. Mix with water as usual, and then bring the milk to boil and pour the agar into the milk and boil it again. Mix in the yogurt. Agar cannot be left to cool off (it will harden), and I am still thinking how can you fold the cream into a warm yogurt mixture. this cake looks super to me ! love the layers and the simple yet mighty decoration! Blueberry jam consist of very little blueberries and they are very sweet. You can try but I am not sure if it will work on the gelee part. Mousse part, probably might still work.